This lip gloss recipe is all natural, organic, healthy and will make your lips shine with beauty and colour. Did you know that many of the lipsticks, lip colours and lip glosses that are sold on the market today contain toxic and health damaging ingredients? The cosmetics industry is a huge industry that plays on our desire to look attractive by selling us all sorts of products that can be very expensive and that are not usually made with our health in mind. Click here for more information about the benefits of avoiding many of the store bought products. When you put a colour or gloss on your lips, that substance will get absorbed into your system via the skin on your lips and at anytime you lick your lips or drink or eat anything. You are basically ingesting whatever you put on your lips. Any dangerous toxins in store bought products (and there are many) that you put on your lips will end up inside of you. Use this lip gloss recipe to make your own lip colour that will not only save you money but will allow you to control the ingredients to ones that are only organic and healthy for you. As this site is continually growing there are always new recipes and information added. 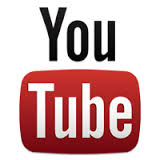 Keep checking back or subscribe to this site to know when anything new is added. For best results always use organic ingredients and make your lip gloss recipe with LOVE - this is the secret ingredient that will take all your homemade products to the next level. See below for more information about the ingredients mentioned in the following lip gloss recipe. double boiler (low heat on the stovetop). Don't have a double boiler? Use a bowl in a pan of water like I do. In a double boiler on very low heat warm the alkanet root in the olive oil. 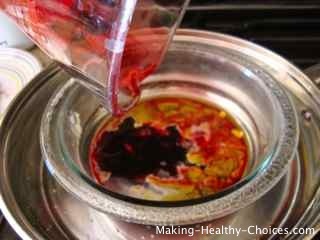 Heat for one hour, stirring occasionally, allowing the colour of the root to steep into the oil. Keep the heat low so as to not damage the integrity of the oil and, therefore your finished product. 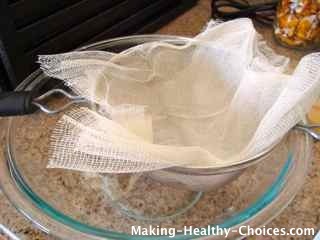 Using a strainer lined with cheesecloth strain the mixture separating the, now coloured, oil from the root. 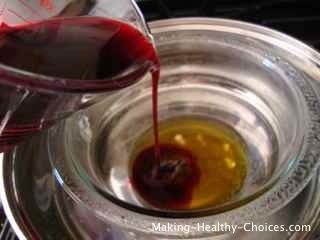 Measure one cup (8oz) of the coloured oil and set aside (if there is extra, save this precious oil in a glass bottle for use another time). This coloured alkanet oil is what you will use for the rest of this recipe, the root can be composted. Next, melt the beeswax in your (clean) double boiler on low heat. 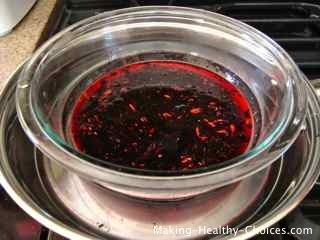 Once it is completely melted add the 1 cup of alkanet oil that you set aside earlier. At this stage the beeswax may partially solidify again so you will need to let it all melt together. 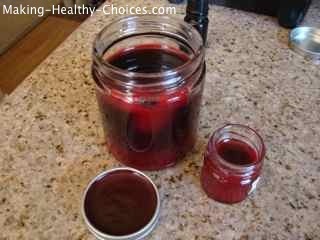 Have your empty glass jars or tins ready that you will be using to store your homemade lip gloss. 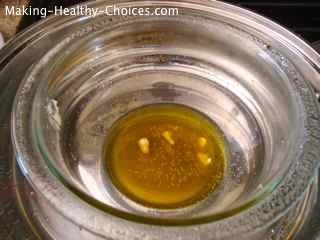 Once the beeswax and oil are completely melted together pour this mixture into your spouted glass jar (for ease of pouring). Add the essential oil and quickly (but carefully) pour into your jars and tins. You will need to do this quickly because the mixture will begin to harden before long. Allow to cool, cover and store in a cool place away from sunlight. Enjoy your beautiful, shiny red lip colour! Have other ideas? Please share in the comments section below. Alkanet Root is part of the borage (boraginaceae) family. The plant produces a beautiful blue flower and the root is a deep burgundy red colour. The root produces a natural and completely non-toxic colour when steeped in oil. Alkanet has astringent, antimicrobial and wound healing properties. To learn more and/or to purchase alkanet root, click here. Beeswax is a beautiful golden colour and carries the gorgeous fragrance of honey. Beeswax is healthy for the pores of our skin, is emollient and antiseptic. Bees produce beeswax to house honey in honeycombs and they work very hard to do this. Please act responsibly when obtaining beeswax and be sure to only use wax from a reliable, kind and sustainable source. Bees are very important to the health of our planet; they and the amazing products they produce need to be respected and treated with care. There may be some that have an allergy to beeswax. To learn more and/or to purchase beeswax, click here. Essential Oils are amazing to have on hand. They have a variety of uses including being added to many of your homemade products. Essential oils are the oil extracted from a plant by steam distillation. They are pure and highly concentrated and, so, a very little goes a long way. With essential oils always be sure to purchase from a trusted source and get oils that are therapeutic grade. I buy many of my oils from Mountain Rose Herbs and am always impressed with their high quality. Essential oils are antimicrobial, anti-fungal, anti-viral and antibiotic which make them ideal for many applications from cosmetics to medicines to cleaning products. Adding them to your products will also help to preserve and extend the life of your homemade creations.